Michaela Onyenwere has almost tripled her point production as a sophomore. Maria Noble/WomensHoopsWorld. Michaela Onyenwere truly arrived on the ninth day of the season. After respectable showings in UCLA’s first two games, the sophomore forward unleashed the dragon against then-No. 14 Georgia in the Bruin’s third outing – a lunchtime matinee match up. 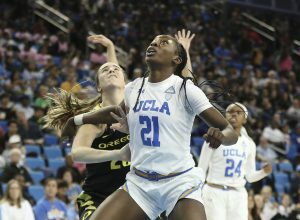 Onyenwere scored 25 points on 11-19 shooting, grabbed 11 rebounds – five of which were offensive – dished four assists, and had two steals and a block. She played all 40 minutes in leading her team’s upset win. Since then, Onyenwere has scored 24 or more points in five more games, has notched five double-doubles and has matched her career high of 29 points twice. She made one three-point shot last year, but already this season she is 8-25 from beyond the arc, including two games of three shots – both career highs. 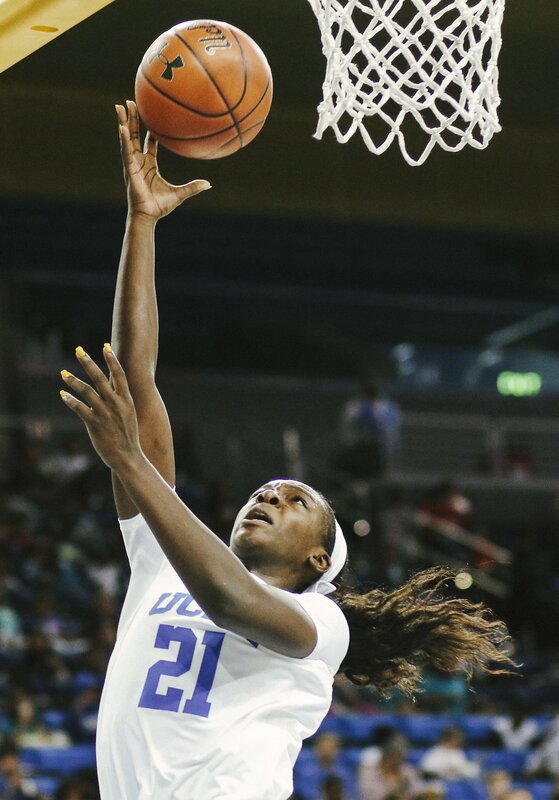 Onyenwere has increased her overall numbers substantially from her first year, when she averaged 6.9 points and 4.7 rebounds per game in 17.1 minutes on the floor. This season she averages 16.6 points and 8.2 rebounds in 31 minutes per game. 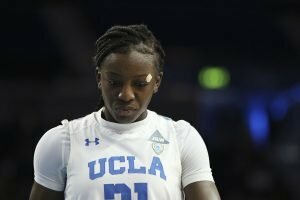 In all of last year Onyenwere dished 17 assists and blocked 13 shots; so far this season she has 17 assists and 19 blocks. 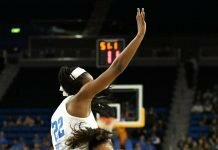 She is the rebuilding-Bruins’ leading scorer and second-best rebounder by being a playmaker, a threat from both inside and out, and a burgeoning leader. Michaela Onyenwere lays it up and in. Maria Noble/WomensHoopsWorld. 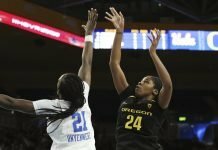 Nineteen-year-old Onyenwere had plenty of shining moments in her debut season: three double-doubles, two Pac-12 Freshman of the Week honors, and conference All-Freshman team. She was one of only two on her team to grab more offensive than defensive rebounds, with an 84-81 differential. 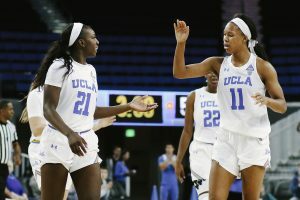 But Onyenwere was playing behind two of the program’s all-time greats in forward Monique Billings and guard Jordin Canada, as well as other veterans who guided the team to an Elite Eight appearance. Billings left as UCLA’s all-time blocks leader and Canada reset the mark for all-time assists. Onyenwere, who was a Colorado high school state champion as a senior, the state’s three-time Gatorade player of the year and a McDonald’s All-American, took a different role upon arrival in Westwood. Close knew that would have to change, however, and before the Bruins took a summer break, she met with Onyenwere. Somehow, Onyenwere made this happen after working a 10 a.m.-6 p.m. daycare job. She worked with trainers for her former club ball team, the Colorado Hawks. Theo Davis, president of the organization, said Onyenwere striving to increase her skill set was a deja vu. 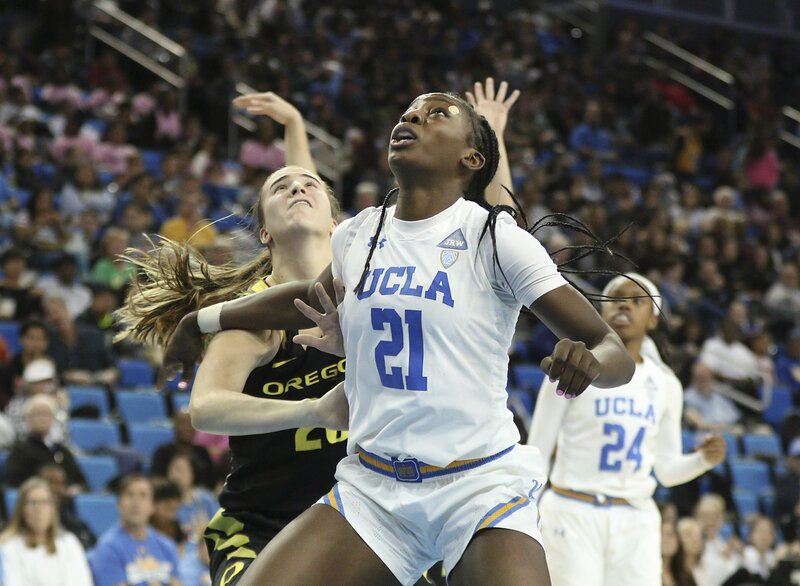 UCLA has had an up-and-down season as they continue to find their footing, but Onyenwere’s play and willingness to step up grows with each game. Close said Onyenwere’s skill set gives the Bruins options. Michaela Onyenwere and Lajahna Drummer celebrate after a bucket. Maria Noble/WomensHoopsWorld. Another thing that keeps Onyenwere in growth mode is that she is a student of basketball. 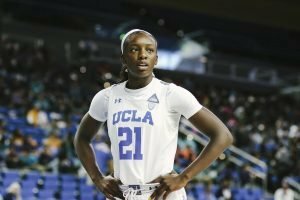 Onyenwere’s teammates are taking cues from her development. Miller said Onyenwere’s character influences the team, as well. Onyenwere’s easygoing friendliness and always-present smile belies her on-court onslaughts. Josh Ulitsky, Onyenwere’s high school coach, said that as much as her game is growing, she is the same young woman he has always known. Close said Onyenwere’s team-first approach and her work ethic makes her a winner. The willingness to go from star to learning mode as a Bruin newcomer is also paying dividends. 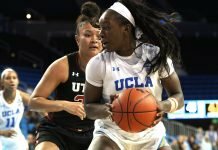 Currently tied for eighth in the Pac-12, the Bruins will need Onyenwere to continue making adjustments. UCLA takes on rival USC tomorrow at Pauley Pavilion, in the second game of the season series.